WA’s Geraldton Coral coast, Abrolhos Only 4 hours north from Perth. 50 mile West to marine areas of coral reef surrounded over 100 km’s, 122 islands. See historical sites, local attractions such as the Batavia Shipwreck, West and East Wallaby islands, Pigeon, Rat and the special Pelsart group. 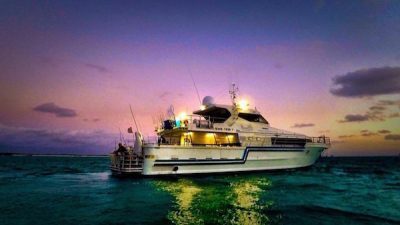 Our Vessel is a purpose built for northern conditions, licensed for Kimberley fishing, Dive Charter boat operations, fitted with all the mod cons and luxurious extras to fish in style. 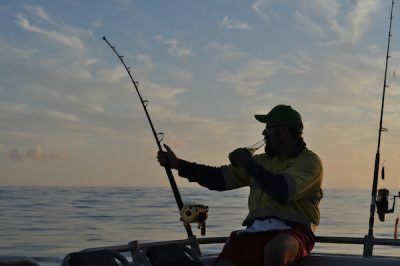 Skippers are well experienced in the fishing & charters along the coral coast, keeping you entertained along your adventure. Pelican Charters Purpose to refurbished Livewire for the perfect fishing tour to the Montes with top, live on board accommodation for up to 18, cabins, large deck area for evening entertainment, a large marlin board for night fish, with access and bait stations positioned around the whole boat. The boy so far can’t believe they are on a fishing boat, they tell me “Ive got a beer in one hand and fishing rod in the other, whilst watching the footy!” What else could you ask for?